Pit Stops have always been important in F1, less time spent in the box usually means less traffic on exit (if the strategy guys have done their job well) and could mean jumping an opponent in the stop. With Ferrari leading the pit stop game at less than 3 seconds for a stop this year it has become crucial to make faster and faster stops. 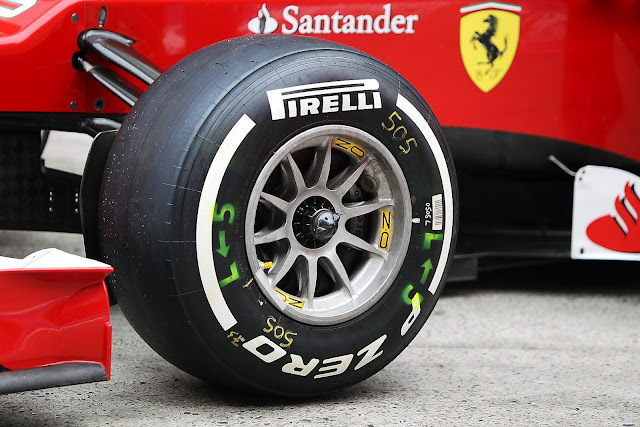 Ferrari & Mercedes have adopted a 'Nut in Wheel' solution which means the nut floats within the rim itself. This saves time for the tyre removers/fitters and gun man as there is physically one less job to do. However when things go wrong the system can be catastrophic. If the wheel isn't aligned correctly when fitted and the nut cross threads you can't simply remove the nut and place on the spare (Teams without the 'nut in wheel' solution have a spare to hand) This was the reason for Mercedes/Schumacher's retirement in China. If however the car hadn't left the box they would have needed to change all 4 wheels as you can't simply bolt on 1 wheel from another tyre allocation. Ferrari have also gone down the route of less threads on the shaft, meaning less rotations of the nut. From the picture comparison below you can see that on the left Ferrari have 3 turns on the shaft with much wider spacings in comparison to McLaren (on the right) with 5 much narrower threads. 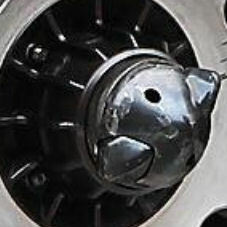 The Ferrari system is further helped by large retracting pins in the end of the shaft. These pins are spring loaded so when they push the wheel or gun on the pins push into the shaft. Step 1 - Place wheel over the shaft, as the wheel goes over the shaft the pins retract into the shaft, once the wheel is on the pins snap back. Step 3 - Wheel Gun man places the gun on which isn't impeded by the retracting pins as they only reach the outer edge of the wheel nut race. McLaren have had problems at the left rear of the car firstly with Jenson in China and twice more with Lewis's car in Bahrain. Having the problem on the same side on 3 occasions I feel cannot simply be an error by the pit crew and must be some kind of flaw in the McLaren system. I have previously speculated about heat being an issue and still believe this could be plausible. Especially if we consider that as the heated aluminum nut is taken off remnants of that nut could be left behind on the threads making placing a new nut on the threads difficult. 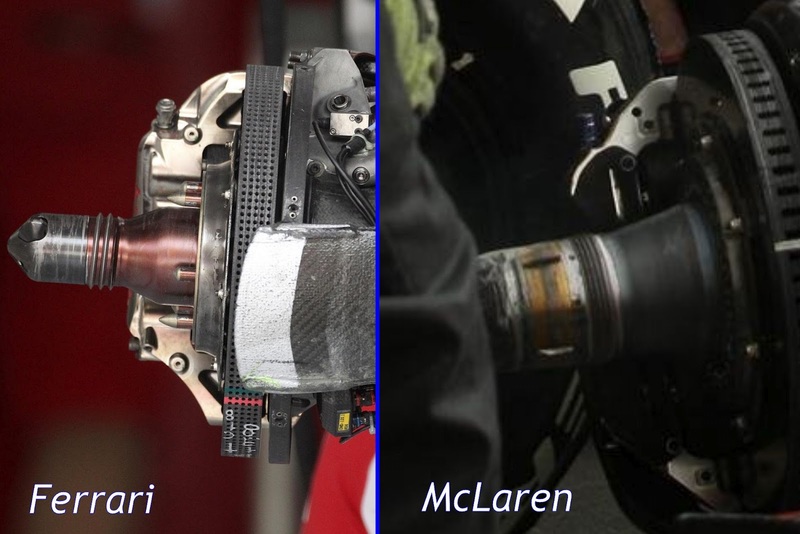 If we ignore heat and take Ferrari's system as the benchmark (as it's the fastest) we can see that McLaren also have the retracting pins in their shaft, however these pins are much smaller and offer no concrete method of holding the wheel in place whilst the nut is attached as the nut will also push over the pins allowing the wheel to unseat. Just some thoughts: the smoother form of Ferrari's large pitch threads are unlikely to cross-thread (unless damaged). Mclaren's threads are too fine. The large lead (gives more linear movement / rev) of the Ferrari thread ensures the wheel will engage quicker with hub location spigots giving stability when fitting the wheel. The Ferrari retracting pin clearly works providing (as you have said) excellent alignment between wheel nut and stub axle. The amount float of the nut in it's housing will be small but with a big eye on thermal expansion. The inner faces of the pins are not flat but are close to being perpendicular to the stub shaft giving swift wheel nut location whilst allowing the pins to retract promptly when being undone. It is a click-on and torque up system. Some may argue that the pins may slow down wheel detachment if the nut becomes loose. My jury is out on this. The McLaren mini retracting splines will keep the wheel nut concentric with the stub axle with the wheel being engaged with the hub location spigots. The thread form is the core weakness here. David Fraser. Thanks for the response David, I agree. Do you have to pay to use Sutton images? Images are taken from F1zoom (as credited) but are originally from Sutton i'd imagine. Yes they are sutton images, F1zoom just downloaded them and rehosted (illegally I imagine). I think you should at least credit Sutton before they contact you about using them. They would have to purchase them from Sutton to have them in that resolution ;) Anyways in future I'll credit Sutton too as it's their work. You don't have to purchase them to do that but ok. The post is talking about in car wheels. Useful post. I am looking few tips off car accessories & got some useful tips from this post.Thanks for sharing for car wheels. Please advise - I attended the Shell V- Power Nitro + Festival at Nasrec this past weekend and saw the following which no one there could give me an answer for. There was a area in the display tent where we as public could have a go at changing the wheel on a dummy car set up. The thing I could not understand is the one wheel used a right hand thread to fasten whereas the other wheel used a left hand thread. On asking I was told that this is how it is on the actual cars that Ferrari run but they could not say why. Is it true and on which wheels does this happen front or rear? I have only just seen this more than three months after it was posted. Using left and right hand threads on opposite sides of the car has been around for probably 80 years or more on centre lock wheels. The idea is that the revolution of the wheel will cause the nut to self tighten. If both sides of the car used the same direction of thread then one side would naturally self tighten whilst the other would try to loosen as the car was driven. I love reading through your blog, I wanted to leave a little comment to support you and wish you a good continuation. Wish you best of luck for all your best efforts. Does anyone know which Teams are using the "Nut in Rim" technology 2014? Very nice blog about mazda tyre replacement and audi mot. Very nice set of wheels..and just amazing knowledge about mazda tyre replacement & audi mot.